In 2013, it seems safe to say that by almost any measure—viewership, ticket sales, merchandising—America considers football to be its national pastime. Gone are the days when youngsters snuck into the Polo Grounds or Fenway Park to catch the matinee performance of their favorite ballplayers; now is the era of Friday Night Lights andMadden. Of course, only the thinnest slice of those kids who grow up dreaming of gridiron glory actually achieve it at the highest professional level; over a million U.S. teenagers play high school football, and only 1,696 roster spots exist in the NFL. Yet despite this miniscule success rate, nearly two thousand successful cases is certainly a large enough sample on which to perform some analysis. In this case, I’ll look at how that NFL talent is distributed across the country. 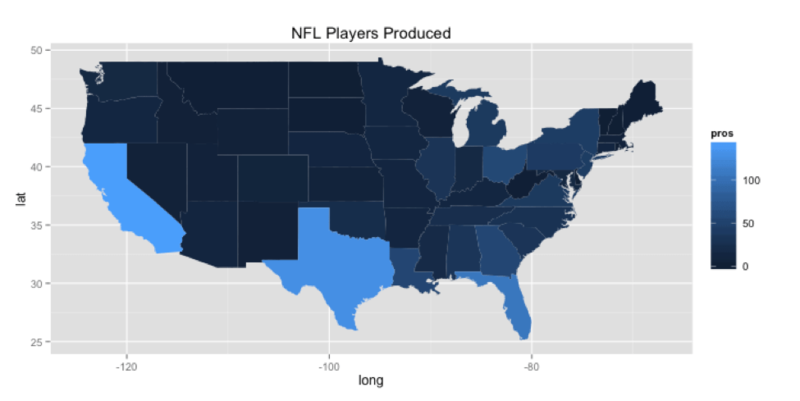 I examined the birth states of all active NFL players from the records kept on pro-football-reference.com and combined this with state population estimates from 2012 U.S. Census data. There were quite a few players that PFR listed as having “Unknown” birthplaces, but I assumed for the purposes of this post that the distribution of this group’s birthplaces was similar to the data I was able to gather. 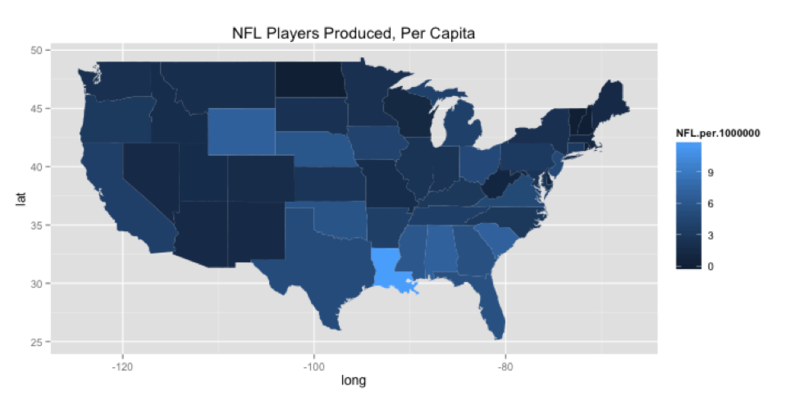 Armed with this dataset, I determined the most prolific football talent-producing states, both on an absolute and per capita basis. The first state north of the Mason-Dixon line to appear on the per capita list is Nebraska, at number eight. Though the state contains less than two million people, 14 Nebraskans are on NFL rosters at present. It’s not surprising that the South, the holy land of football, leads the way in NFL players per capita with seven of the top ten states. But the top individual states aren’t the ones you might expect. The triangle of Louisiana, Mississippi, and Alabama comprise three of the top seven states, all of which lie ahead of traditional football sanctuaries Texas and Florida. Of course, these latter two are penalized by this method of measurement for their sheer size. In absolute numbers, Texas and Florida rank second and third in number of active pros with 130 and 107, respectively. The only other state to surmount the century mark for active players is the behemoth of this list, California, which boasts 143 current NFL players. Though it has by far the largest population of any state in the country (nearly 50 percent larger than second place Texas), California still comes in around the middle of the pack (18th) in the per capita rankings, a testament to the football prowess of the Golden State. Bringing up the rear is New England. Despite a near-dynastic pro franchise in close proximity, the Northeast produces almost no native NFL players of its own. Maine, New Hampshire, and Rhode Island have a combined two players currently in the NFL. Massachusetts, the home state of the Patriots, has a slightly less embarrassing total of seven active players, and Connecticut, a state of a little over three million people, has a respectable 11. Still, just two in a million people from all of Patriots territory have reached the highest level of the sport. At Which Positions Have NFL Rookies Had the Most Success? Why did you choose 2012 census data? Given the age of pro-football players, would it not be more appropriate to use census older census data from when current NFL players were born, young kids, or in high-school (whichever you feel is more formative to their athleticism)? It is all about the weather, warm weather creates sports power houses with the ability to play year around. Youth football in New Jersey starts much earlier than 10 and I am sure most everywhere else. 2 great things about this: Nebraska shows up per capita, and the use of what looks to be R ggmaps2 package. 000 webmasters to create their online forms. related switch nodes, creating and setting up product builder form ,product model and price combination. builders extra complex laptop software program for net design is needed.